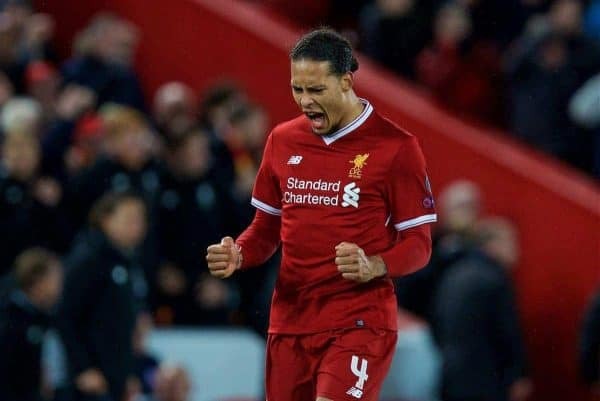 Virgil van Dijk spoke to the media ahead of Liverpool’s second leg against Man City and was clear that the team would have a positive mindset. The centre-back was a rock in the centre of defence in the first leg, helping to keep a clean sheet at Anfield. He was then one of a handful of players who also played against Everton—again managing a shut-out at the weekend. Now the Dutchman has spoken on the challenges ahead in the second leg, when City are likely to come out all guns blazing to try and claw back ground on aggregate. Van Dijk though doesn’t want the Reds to sit back and hope to soak up all the pressure, instead heading out to the Etihad with a positive mentality. “It’s pretty clear that defending a 3-0 lead here is going to be a strange situation but we need to come in with the mindset it’s 0-0, we want to win and we’re capable of scoring goals. Van Dijk also spoke about his happiness with life at Liverpool, vindicating his decision to make the move to Anfield in January. “I came to Liverpool to achieve everything possible. That it happened in winter was fantastic news for me and my family, not just football but living and everything as well. Those same fans he spoke of will be hoping Van Dijk and Co. can produce another faultless display at the back to help the Reds through to the last four in Europe.